Within the BioMechTools programme we will develop diagnostic and evaluation tools to quantify the degenerative status of orthopaedic patients. Our focus lies on the lower extremities. This project will open new research fields related to biomechanical patient assessment and modelling of musculoskeletal pathologies. The aetiology of many musculoskeletal diseases is related to biomechanical factors. However, the tools used by clinicians and researchers to assess the biomechanical condition of patients are often crude and subjective, leading to non-optimal patient analyses and care. For example, clinicians usually base their diagnosis on their own, subjective, interpretation of static imaging data like MRI-images and CT-scans. Yet, it is much more powerful to visualize the pathological tissue in a dynamic manner, i.e. a tear in a meniscus is easier to see when the meniscus is moving than when it is imaged statically. The Orthopaedic Research Laboratory, in collaboration with the Department of Biomechanical Engineering (University of Twente), has been very successful in delivering imaging modalities and in generating patient specific musculoskeletal and finite element models. These types of models can be used to analyse the pathology in detail and to assess the biomechanical consequences of various surgical scenarios. See, for example, our research line ‘Musculoskeletal Biomechanics‘ and the ‘TLEMsafe‘ project. With the BioMechTools project we aim to develop MRI and Ultrasound tools to quantify tissue strains under dynamic circumstances. 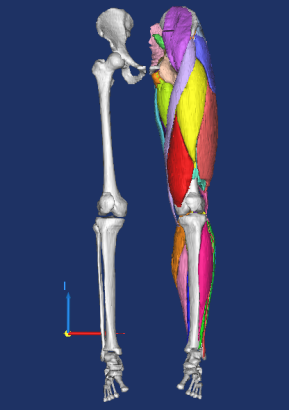 Innovations related to imaging, sensor technology and biomechanical modelling will be utilized to generate versatile, accurate and objective methods to quantify the (pathological) musculoskeletal condition of the lower extremity of patients in a unique manner. These advanced diagnostic, pre-planning and outcome tools will provide clinicians and researchers with detailed biomechanical analysis about abnormal tissue deformations, pathological loading of the joints, abnormal stresses in the hard and soft tissues, and aberrant joint kinematics. Our research will be done in collaboration with the BioMedical NMR group of the Technical University of Eindhoven and the Radiology department of the Academic Medical Centre Amsterdam for the dynamic MRI imaging and with the ‘Medical UltraSound Imaging Center‘ of the Radboudumc for the ultrasound techniques. Co-Supervisor: Nico Verdonschot, Prof. Dr. Ir. Chris de Korte, Prof. Dr.
Bart Koopman, Prof. Dr. Ir. Peter H. Veltink, Prof. Dr. Ir. 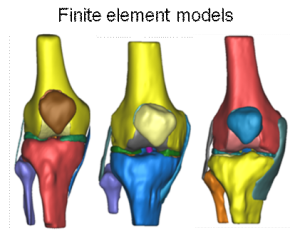 Personalized Musculoskeletal Modeling of the Knee Joint. Ultrasound based Skeletal Motion Capture : the development and validation of a Non-Invasive Knee Joint Motion Tracking Method. Functional MRI of the Lower Extremities. Three-Dimensional Ultrasound Strain Imaging of Skeletal Muscles. Gijsbertse K, Sprengers AM, Nillesen MM, Hansen HH, Lopata RG, Verdonschot N, de Korte CL. A novel diffusion-tensor MRI approach for skeletal muscle fascicle length measurements. Oudeman J, Mazzoli V, Marra MA, Nicolay K, Maas M, Verdonschot N, Sprengers AM, Nederveen AJ, Strijkers GJ, Froeling M.
Physiol Rep. 2016 Dec; 4(24). pii: e13012. Mazzoli V, Oudeman J, Nicolay K, Maas M, Verdonschot N, Sprengers AM, Nederveen AJ, Froeling M, Strijkers GJ. A comparison between dynamic implicit and explicit finite element simulations of the native knee joint. Naghibi Beidokhti H, Janssen D, Khoshgoftar M, Sprengers A, Perdahcioglu ES, Van den Boogaard T, Verdonschot N.
Water and fat separation in real-time MRI of joint movement with phase-sensitive bSSFP. Mazzoli V, Nederveen AJ, Oudeman J, Sprengers A, Nicolay K, Strijkers GJ, Verdonschot N.
A subject-specific musculoskeletal modeling framework to predict in vivo mechanics of total knee arthroplasty. Marra MA, Vanheule V, Fluit R, Koopman BH, Rasmussen J, Verdonschot N, Andersen MS.